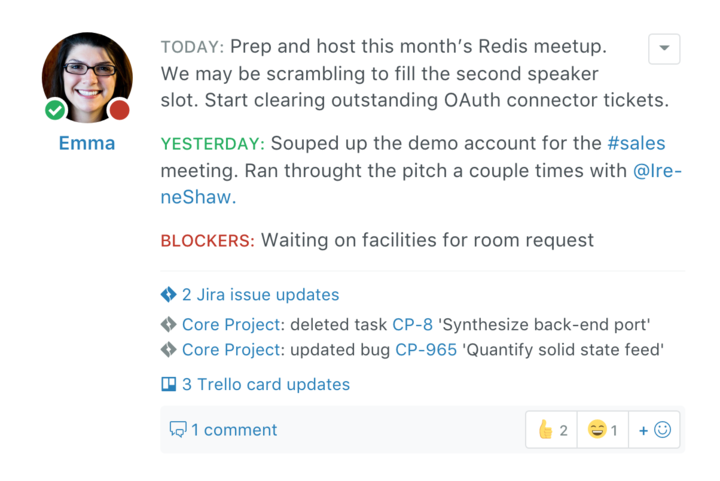 Connect Jira to Status Hero with a webhook, and Status Hero will match up relevant issue changes and work log updates to your team members based on their email address or name. Then, their Jira activity appears in the activity page and alongside their check-ins automatically. To set it up, first, visit the Integrations page in Team Settings in Status Hero, and copy the URL listed there under the Jira panel. Log in to Jira and click on the gear icon in the top-right. Select the "System" option and scroll down the page to the "Advanced" section in the left-hand menu. Under "Advanced", select "WebHooks." Click "Create a WebHook" and fill in the name field. In URL, paste the URL you copied from Status Hero. Log in to Jira and click on "Settings" and select "System." Click "Advanced Settings" in the top-right. On that page, under the "Advanced" section, select "WebHooks". Click "Create a WebHook" and fill in the name field. In URL, paste the URL you copied from Status Hero. Next, in either flavor of Jira, check "created", "updated", and "deleted" under both the "Issue" and "Worklog" lists, and scroll to the bottom of the page and click "Create." To test it out, make an update in Jira and look for a new entry in the activity stream. Once a few activities have been logged, you can use the jira:<issue key> shortcut in check-ins an comments to auto-link issues to your Jira account. You can add as many Jira projects as you want to your Status Hero team using the same webhook URL. Right now, we only support the "created", "updated", and "deleted" actions for issues and worklogs, but if there are others that you'd like to see, let us know! Check to make sure the email address that is being used in Jira matches the email address that is being used in Status Hero. If you or a team member is using a different email address in Jira, set the secondary email address in Status Hero to match the one used in Jira. Status Hero will also try and match updates by first and last name if it can't find a matching email address. Status Hero won't be able to record data retroactively. Make sure you generate some activity in Jira in order to test things out after you've set up the connection. Note: The Jira integration is available in Pro and Corporate plans only. If you are subscribed to the Basic plan, you will need to upgrade to use the Jira integration.